The commemorative hessian gift bag, which was given to guests of the Royal Wedding in Windsor, bears a crest of H&M, and is decorated with a crown, date and location of the wedding. 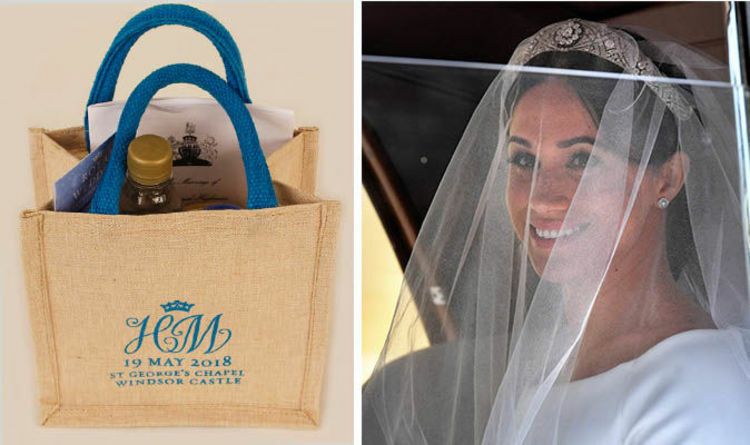 The bag itself, which measures 8.5 x 5.5 x 7.5 inches - contains the official Marriage Order of Service, a Royal wedding commemorative magnet and a sealed chunk of traditional handmade shortbread, made especially for the wedding. The sought after goodie bag also includes a 5-inch golden wrapped chocolate medallion with “HM” inscribed in the middle, as well as a bottle of Windsor Castle spring water and a gift card containing a 20 percent off voucher for the Middle Ward shop at Windsor Castle. The item, which is being sold at New York auction house Gotta Have Rock & Roll as part of its “Rock And Roll Pop Culture Auction”, also comes with a certificate of authenticity and is being sold to raise money for Wildlife SOS, according to the lot"s description on the auction house"s website. The minimum bid starts at £75 ($100), with Gotta Have Rock & Roll auction house expecting offers to reach as high as £1,500 ($2000). Meghan Markle and Prince Harry’s wedding gift bag is the only non-music-based lot to be included in the latest offerings from the famous NYC auction house. Other items in the charity auction, which runs from July 12-20, included items that once belonged to Michael Jackson, Madonna and Jimi Hendrix. The Wildlife SOS charity operates India"s largest elephant rescue and rehab sanctuary and have rescued 30 abused elephants. Although the Duke and Duchess of Sussex support numerous charitable causes, including the Wilderness Foundation UK, Wildlife SOS is not one of their chosen charities. At present, it is unclear who donated the sought-after Wedding memorabilia – but Express.co.uk has contacted Gotta Have Rock and Roll for further comment. The auction house had previously put Princess Diana’s worn dresses from the famed 1997 Christies sale online. The Princess of Wales donated 79 cocktail and evening dressed to the London auction house, which fetched over $41,000 (£31,000) per item. The auction of her personal items benefited cancer and AIDS charities and was attended by more than 1,100 people that same year. Following the Royal Wedding dozens of Meghan and Harry gift bag were being sold on the online marketplace eBay as punters tried to cash in on the couple"s big day.